TERE SAB MARG NA KHOL DO TO KAHENA. KUBER KE BANDHAAR NA KHOL DU TO KAHENA. MERE LIYE KADWE VACCHAN SUN KAR TO DEKH. KRIPA NA BARSE TO KAHENA!! MERI TARAF AA KAR TO DEKH. TERA DHYAAN NA RAKHU TU KAHENA. TUJHE MOOLYAVAN NA BANNA DO TO KAHENA!! GYAN KE MOTI TUJHME NA BHAR DO TO KAHENA!! TUJHE SAB KI GHULAMI SE NA CHUDDA DO TO KAHENA!! TUJHE KEEMTI NA BANNA DO TO KAHENA!! TUGHE SHAANTIDOOT NA BANNA DO TO KAHENA!! TUJHE MASHOOR NA KARRA DO TO KAHENA!! JAGAT KA VISMARAN NA KARRA DO TO KAHENA!! HAR EK KO TERA NA BANNA DO TO KAHENA!! Can you explain the same in english. Dipika, dear, great you are back! Has your monitor finally agreed to function again - or better still, did you get a new one? The poem, dearest sister, would you mind to give an English version, too .... on behalf of those terribly curious sisters of yours ... ? May you always feel under SAI's love light waterfall. one who is really good in hindi. Thank you, Ramesh, my dearest, I cannot understand the slightest little bit in Hindi and all these words need someone who is really good in love and wisdom. Thank you for being the one. 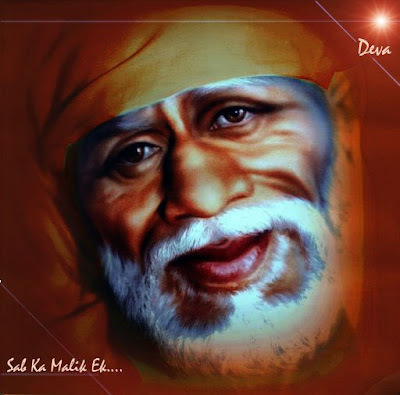 YAHOO SAI BABA FORUM (WELCOME TO SAI BHAKTI WORLD) WE NEED YOU..
Tare Bacha hai Hum bacho ki Raksha Karna"
Duniya mey ab sub choot chuka hai mujko raha dekhlana"
mey agyane bacha hu aap ka mujko apna haath thamao"
Tu ho lija uske Saath. Thank you very much for such a lovely poem. I remain indebted to you. it was like baba talking to us. For the sake of feeling the poem I have translated it into English for few of my sai bandhus. Please forgive me if there are any mistakes. I have left few lines in hindi as I was not sure about the meaning. I am feeling really good after writing it again with my own hands. I am in tears now. May be baba wanted to teach some lesson to me as I was restless since yesterday. Just before logging in I was blaming him and here comes baba’s reply to my behavior. I am also thankful to mysai keerthi ji for posting a reply to this topic and bringing it to our notice again otherwise I would have missed such a nice poem. When all your paths do not open, then blame me. If I don’t make you kuber, then blame me. If I don’t shower my grace, then blame me. If I don’t take care of you, then blame me. If I don’t make you valuable, then blame me. If I don’t fill you with pearls of knowledge, then blame me. If I don’t free you from slavery, then blame me. If I don’t make you precious, then blame me. If I don’t make you soul of peace, then blame me. If I don’t make you popular, then blame me. If I don’t make everyone yours, then blame me. JISKE SIR UPAR TU SWAMI SO DUKH KAISA PAAYE! 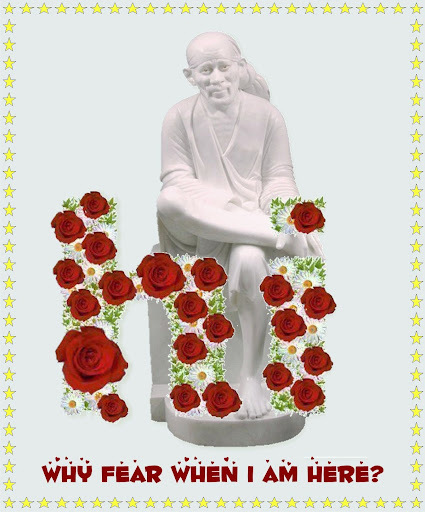 Mere Sai Samarth Maharaj ki jai! Dreams are Good, But Realities are batter. suree..........baba bless you With "Har EK"
Baba, Please help me in my present job baba. Already i am suffereing too much i cant now baba please baba. and bless me baba i love you baba.